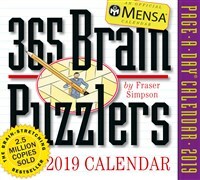 It’s boot camp for the brain in the calendar that puzzle enthusiasts return to year after year. There’s a challenging and fun Mensa-approved game to kick-start every morning or workday: logic puzzles, spatial challenges, probability riddles, crosswords, and encoded words. If you want to check your work (or throw in the towel), answers and explanations are on the reverse side of each page. The ideal gift for a brainy friend who loves a mental challenge.